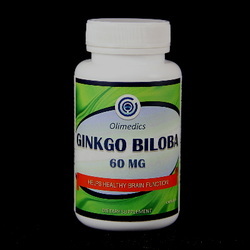 Ginkgo Biloba may improve blood flow to the legs, arms and brain. Studies have shown that ginkgo may help to enhance peripheral circulation and support memory function and mental alertness. Research has shown that Ginkgo biloba has cardioprotective effects mediated by the regulation of inflammatory and vasoactive mediators, as well as the inhibition of membrane lipid peroxidation. Take 1 capsule orally 1 to 2 times daily preferably with meals or as directed by a healthcare professional. Do not exceed recommended dose. Pregnant or nursing mothers, individuals with bleeding disorders, seizure disorder, taking anti-coagulant or MAO inhibiting drugs, children under 18 years of age and individuals with any known medical condition should consult a physician before taking this or any dietary supplement. Active ingredients: Ginkgo biloba extract. Other ingredients: Maltodextrin, gelatin (bovine), vegetable magnesium stearate and silicon dioxid.